December and the Advent season is one we associate with joy and the upcoming Christmas holiday. I am so excited to begin this new series together: JOYful Learning!! It is divided into 5 parts: each Tuesday and Friday, beginning today! Please share your ideas via comments! With all the emphasis on test scores and following publisher’s teacher editions the last decade or so, teaching was just not as fun as it used to be. I noticed students could obediently memorize almost anything, but without an understanding or sense of joy for the love of learning. To find this joy as a teacher again, and to make learning joyful for my students, has been my passion and purpose for the last few years! I began by researching studies on joy, read articles on joy, as well as doing informal teacher observation/research on what seemed to bring my kids great joy. I came across the article, “Joy in School” by Steven Wolk, published in The Positive Classroom, September 2008, Volume 66, Number 1. The title caught my eye; it’s just what I had been looking for! I love Wolk’s philosphy, so parallel to my own, “As educators, we have the responsibility to educate and inspire the whole child—mind, heart, and soul.” Since initially reading this article, I’ve been giving many workshops and staff developments on the topic of Joyful Learning; teachers always say this topic is just what they needed to refocus themselves and rethink WHY they went into teaching in the first place. This series is based on Wolk’s 11 principles of JOY and I hope you will join in the conversation! 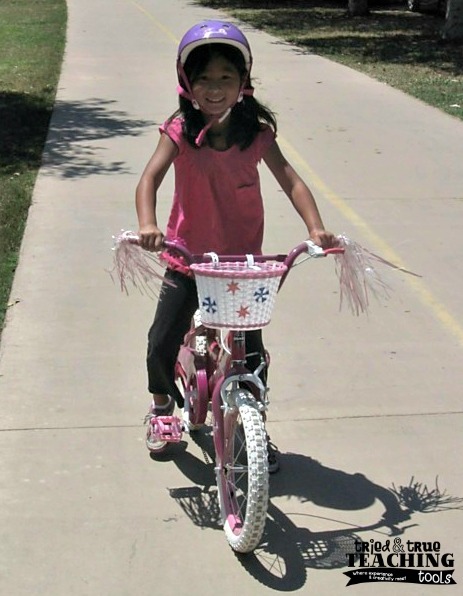 I recall my youngest daughter first learning to ride her 2-wheeler bike. As her sister jogged down the street, holding onto the back of her seat, then letting go. . . that look of pure JOY and exhilaration filled her face. All our neighbors were outside, clapping and cheering as she rode by. The joy of learning! School cannot be primarily about creating test-takers, we need to nurture the whole student! What can we do IN our classrooms to bring students that sense of joy? Goal setting is a huge part of my kids’ learning process. As THEY choose a goal to work on (which may be very different from a goal their parents or I may have for them! ), students take ownership of their learning. They are motivated to work towards this goal and get to experience the joy of accomplishment! To help my students stay focused, each child has his/her goal attached to the corner of their desks. They look at these goals all day long and gather evidence, as they work towards achievement. This has helped to instill a love for learning because they have the buy-in! Now, I cannot offer this variety of lessons/activities to my students, but I CAN allow some choice within my classroom. Several ways to do this: when focusing on a math concept, during independent work time, my students work on Math Menus. 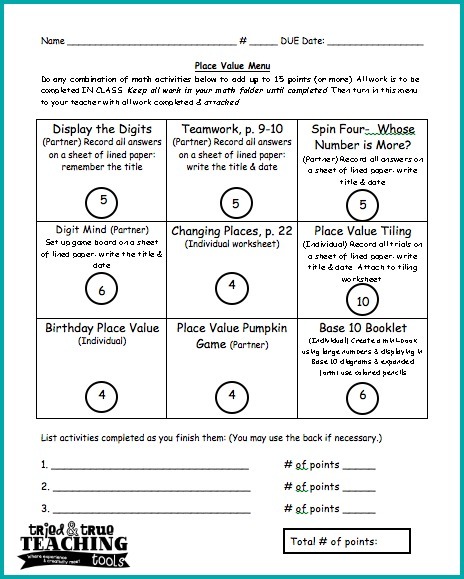 I've pulled activities from our math series resource box, Marilyn Burns lessons, TpT products, Marcy Cook tiles, etc. These menus are differentiated for varying levels of ability: both independent and partner activities. Although my students are all practicing the same math skills, they LOVE knowing they have a say in HOW and WHAT they practice. 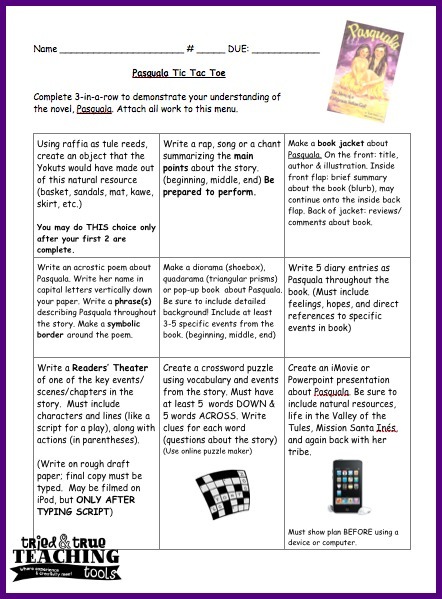 After finishing reading a novel, instead of having my class do the same culminating project, they have a Tic Tac Toe board. The board is set up with tasks based on learning styles and Bloom’s Taxonomy. For my tactile learners, there is a choice of making a product with their hands. For my verbal kids, they can write and perform a rap/song. For my tech-savvy students, they can create an iMovie or powerpoint. 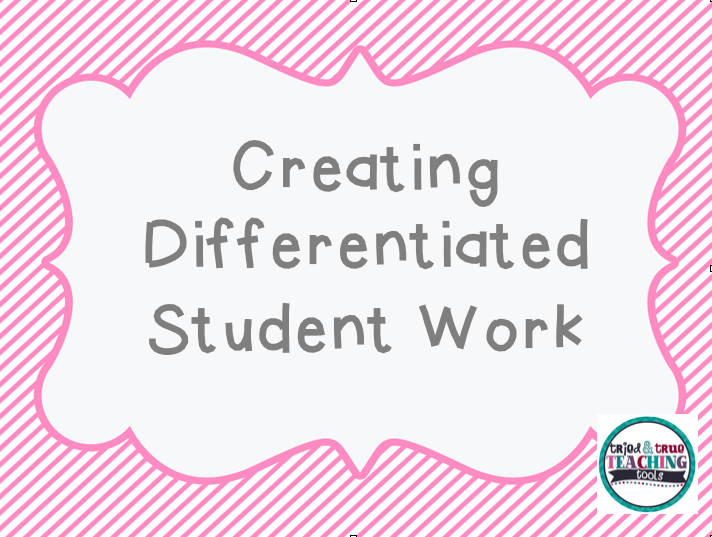 You can learn more about how to create differentiated work for students to increase choice. Strategies and step by step directions are included in my Creating Differentiated Student Work powerpoint.Click here!! And it’s on sale today!! When researching non-fiction topics, I allow my kids to choose HOW to demonstrate what they have learned. One of the favorite book reports of the year is our non-fiction genre. Each student chooses a subject THEY WANT to learn about. After selecting & reading a non-fiction book on this topic, they have to decide how to best show their comprehension of what they have learned. You’ve never seen so many students excited to tackle difficult material! 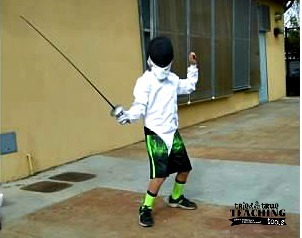 I've had everything from "How to Do Tricks with a Yo-Yo," (demonstration) to "How to Train Your Dog," (iMovie showing dog training) to "The History of Nascar Racing," (video in a sports news format) and even "Fencing Techniques" (demonstration). They all showed true JOY in learning! How do you help your students find joy in the process of learning? What types of choices do you give? Please comment! Be sure to stop by on Friday for Joyful Learning, Part 2!